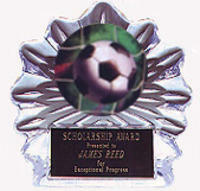 Acrylic soccer ice awards are a unique & affordable awards for your team, coach or sponsor. We offer two styles, both have two sizes to choose from. They make great tournament awards or end of the year league awards. You get 40 characters of FREE engraving, anything over that is $.07 a character. Orders ship in five to seven business days. Rush orders are available, please contact 800-787-8777 if you need your order rushed.